For thirty years, the Syracuse St. Patrick’s Day Parade has had to put up with snow, sleet, cold, rain and wind. Never has it had the day it had this year. Blue skies and temperatures in the low 70’s F (low 20’s C) brought out a record number of people to watch the three hour parade head down South Salina Street. A high school band waits for their turn in the Syracuse St. Patrick's Day Parade next to the Soldiers and Sailors' monument on Clinton Square in Syracuse, New York. Nikon D700/28-300VR, 1/250s, f/13, ISO 200, EV 0, 52mm focal length. Fittingly, St. Patrick lead off the parade played by Onondaga County Sheriff Kevin Walsh. 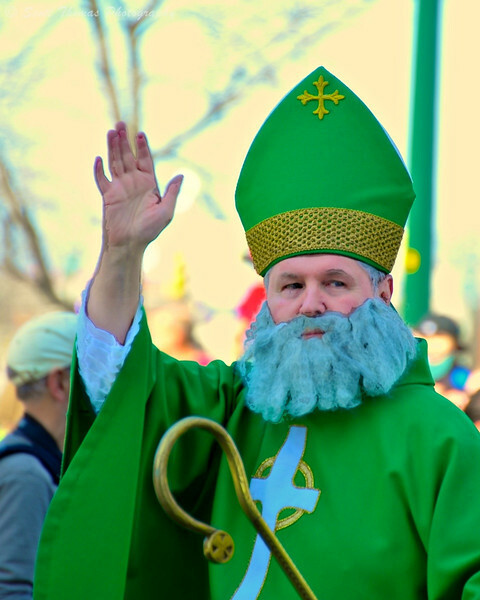 St. Patrick lead off the Syracuse St. Patrick's Day Parade in Syracuse, New York on March 12, 2012. Nikon D700/28-300VR, 1/160s, f/6.3, ISO 200, EV 0, 300mm focal length. Kids on a float in the parade having their own kind of Irish fun. 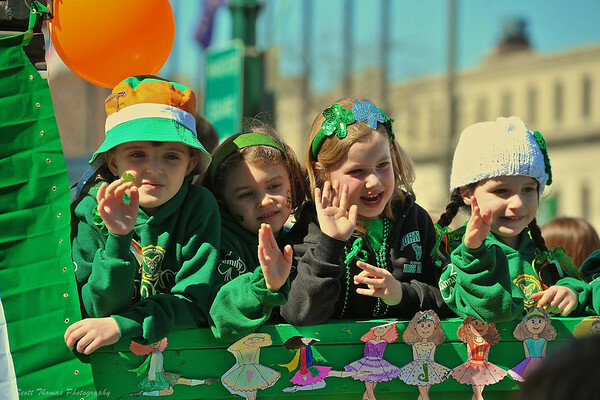 Girls waving to the crowd from a float in the Syracuse St. Patrick's Day Parade in Syracuse, New York. Nikon D700/28-300VR, 1/400s, f/8, ISO 200, Ev 0, 300mm focal length. 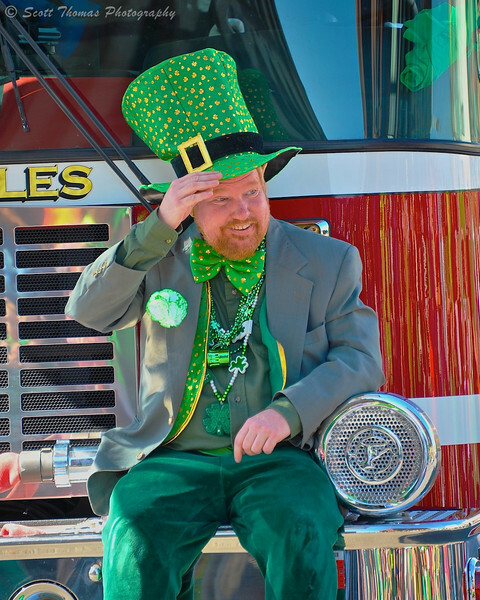 Leprechauns kept showing up throughout the parade including this one riding on the front bumper of a fire truck. A leprechaun riding on the front bumper of a fire truck in the Syracuse St. Patrick's Day Parade in Syracuse, New York. Nikon D700/28-300VR, 1/125s, f/5.6, ISO 280, EV 0, 300mm focal length. The luck of the Irish was surely with us on this March 17th. 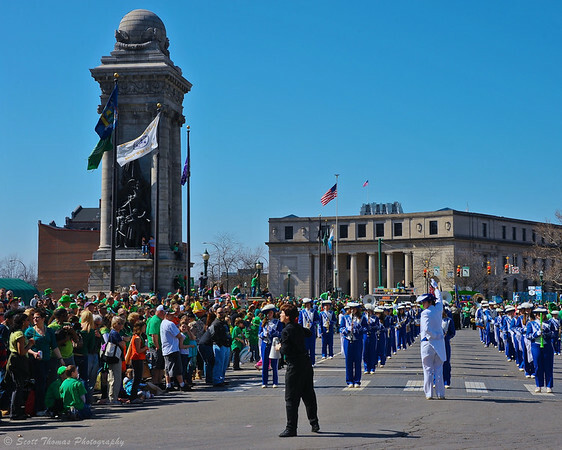 This entry was posted in People, Weekly View and tagged 28-300mm, building, children, clinton square, crowd, girls, green, kids, leprechaun, marching band, monument, new york, nikon D700, parade, sailors and soldiers, st. patrick's day, street, syracuse, vr. Bookmark the permalink. Fun pics! Let’s hope the luck of the Irish stays with us for a while! Loving these 70 degree days. That green looks so fresh and beautiful in the sunshine. Each of your photos reveals such a different aspect of the parade. Very nice. Thank you, Amy-Lynn. It was very crowded and I had to photograph over and around people.